Wales Millennium Centre is regarded as one of the most vibrant arts developments in Europe. The Millennium Centre brings the best of the world to Wales and showcases the best of Wales to the world. Its sparkling atmosphere was achieved with the help of Multiload’s VoltMaster. Arup Cardiff in conjunction with N G Bailey contractors were responsible for electrical engineering at the Millennium Centre. They specified the need for transformers which could react quickly to accommodate mood changes in auditorium and aisle lighting. The transformers had to be capable of guaranteeing optimum lighting effects for the low-voltage dichroic lighting that was to be used. 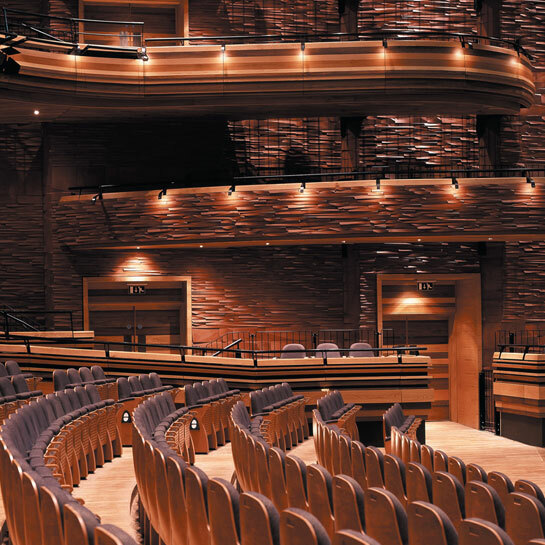 The Millennium Centre was a major user of low-voltage tungsten halogen 12V lighting, with almost 2000 fittings illuminating its distinctive entrance, concourse and auditorium. Specialist theatre lighting and acoustic needs together with demanding maintenance requirements meant that transformers could not be situated adjacent to light fittings in the auditorium. Multiload’s VoltMaster suited all the needs of this application, for which N G Bailey specified the use of 252 x 400W and 63 x Superfast 400W dimming VoltMaster transformers. Voltmaster was chosen because it could be remotely positioned up to 50m away from light fittings, therefore outside the auditorium. This was essential for acoustic and maintenance reasons. It could compensate for voltage drops, while still giving a stabilised maximum voltage of 11.8V RMS at the lamps, guaranteeing sparkle. VoltMaster could also enable desired changes to auditorium aisle lighting and wall washers for stage lighting and mood effects. There are maintenance benefits too. Because VoltMaster can be mounted remotely, there is minimal visitor disruption when transformer maintenance is undertaken, as the need for scaffolding is eliminated. VoltMaster is more reliable than standard low-voltage transformers and vastly extends lamp life, resulting in significant lamp replacement and labour cost savings. Since installation, the low-voltage tungsten lighting has been replaced with energy-saving LEDs. VoltMaster was chosen because it could guarantee optimum lighting effects for low-voltage lighting, meeting specialist theatre lighting and acoustic needs. It could compensate for voltage drops, yet still give stabilised maximum voltage at the lamps, guaranteeing sparkle. It could be remotely positioned, essential for auditorium lighting.